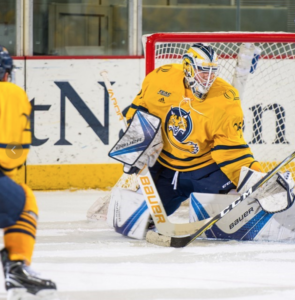 The Quinnipiac men’s ice hockey team fell at the hands of UMass Amherst on Friday night at home by a score of 2-1. 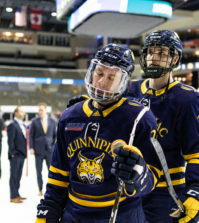 After it looked like Quinnipiac may have been heading in the right direction after two dominant games against Brown and Yale last weekend, the Bobcats were unable to channel that same ability to finish and fell into a similar hole against the Minutemen. 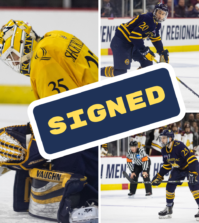 Sophomore forward Alex Whelan led offense with a career-high nine shots on goal, while both junior forward Thomas Aldworth and junior defenseman goal-scorer John Furgele mustered four of their own. Despite controlling the better part of play in the offensive zone and outshooting the opponent (33-25), as the way the season has gone so far, the Bobcats were unable to bury their chances yet again. The offensive pressure and inability to score began just five minutes into the contest when senior forward Tanner MacMaster and freshman forward Odeen Tufto had a 2-on-0 break. The puck was initially mishandled, but UMass goalie Ryan Wischow was able to catch a rebound opportunity with his glove hand to keep the Bobcats off of the board early. About five minutes later, UMass forward Mitchell Chaffee broke into the zone, got the puck on net and followed up with his fourth goal of the season to put the Minutemen up 1-0 going into the second period. Just under two minutes into the next frame, Tufto made a cross ice pass to MacMaster, who found Furgele at the top of the circle for a one-timer that flew under Wischow to tie the game at one. Not only did the goal give Tufto his tenth assist of the season, extending his team lead in points and assists, but it was Furgele’s first goal as a Bobcat after transferring out of the University of New Hampshire two seasons ago. 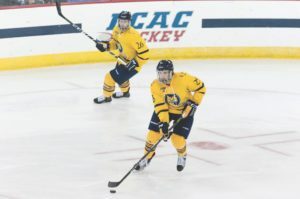 Right when it seemed like Quinnipiac was gaining much-needed momentum, the Minutemen sucked the energy out of the building by regaining the lead two minutes later. UMass defenseman Mario Ferraro made a move at the blueline to evade junior forward Thomas Aldworth before snapping a shot over the shoulder of sophomore goalie Shortridge, off the back bar and in. The third period saw steady physicality, most notably midway through the period when senior forward Kevin Duane threw what looked to be a clean hit. There was no initial call on the play, but ultimately Duane was ejected from the game and assessed a five-minute major for a hit to the head in addition to a 10-minute game misconduct. This left the Bobcats in an impracticable situation on the penalty kill in addition to losing what is already a scarce position at center. 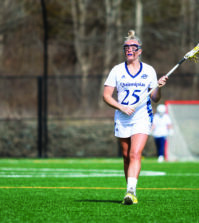 After successfully killing off the penalty, Quinnipiac had late chances to tie the game up. With about one minute remaining in the game, Pecknold pulled the goalie and the Bobcats went back to work in the offensive zone, searching for a way to score. With the extra attacker, junior forward Scott Davidson found himself with the puck on his stick in a prime scoring area, but was unable to finish as the puck rolled off his stick. Subsequently, junior defenseman Brandon Fortunato took a shot with traffic in front of the net, but rang post from the point. That was as close as Quinnipiac came to tying the score. The Bobcats travel to UMass Amherst for the second game of a home-and-home at 7 p.m., in hopes of finding their game and another tally in the wins column. Justin joined The Chronicle in 2015. 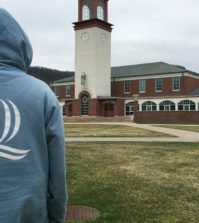 He is a former Quinnipiac men's ice hockey writer, former Sports Editor and former Web Director of the newspaper.